Growth status of children and adolescents with type 1 diabetes mellitus in Jeddah, Saudi Arabia: A cross-sectional study. King Abdulaziz University Hospital, Pediatric Department, Jeddah, Saudi Arabia. Type 1 Diabetes Mellitus (T1DM) is one of the most common chronic endocrine disorders among children and adolescents. As the incidence of this disease is dramatically increasing worldwide, complications of T1DM, including impaired children growth, remain a major concern. However, the question of whether growth is affected by the degree of diabetic control is still debatable. To address the relationship between both metabolic control (as assessed by hemoglobin A1c [HbA1c] levels) and duration of the disease and the growth status in children with T1DM. A cross-sectional study was conducted at King Abdulaziz University Hospital (KAUH), Jeddah, Kingdom of Saudi Arabia from June to August 2017 in 189 children aged from 3 to 18 yrs. The mean and standard deviations for height, weight, and Body Mass Index (BMI) were calculated and matched with both HbA1c levels and the duration of T1DM. Of the 118 children with T1DM, the mean age was 11.2 ± 4.2 yrs. The mean HbA1c level was 9.15%. Approximately 43.2% of children had poor metabolic control (HbA1c>9.0%), 32.2% had intermediate metabolic control (HbA1c=7.5-9.0%), and only 17.8% had good metabolic control (HbA1c<7.5%). The height z-score was significantly lower in patients in the intermediate control group than that of those in the good metabolic control group (p=0.049). There was also significant difference in weight z -score (p=0.008) with patients in the poor metabolic control group have lower score than the patients in the good metabolic control group. There was no association between the duration of diabetes and the height, weight, or BMI z-scores. There was a correlation between HbA1c levels and height z-scores; patients in the intermediate control group had lower scores than those in the good metabolic control group. However, the HbA1c level was negatively correlated with both weight and BMI z-scores. Adolescents, Children, Growth status, Hemoglobin A1c, Metabolic control, Saudi Arabia, Type 1 diabetes mellitus. Type 1 Diabetes Mellitus (T1DM) is one of the most common chronic endocrine disorders among children and adolescents . As the incidence of this disease is dramatically increasing worldwide , diabetic complications represent a major concern despite the advances in treatment. Impaired growth, one of the longterm consequences of T1DM , is described as a growth rate that is under the appropriate growth velocity for both age and gender . Factors affecting the growth in diabetic patients include: gender, genetics, age at diagnosis, duration of the disease, glycemic control, puberty status, and the levels of growth hormone . However, the question of whether linear growth is impaired in diabetic children is still debatable. Several researchers have documented that metabolic control in patients with T1DM is an important determinant of final adult height [6,7], while it has been found that growth in such children is normal and not affected by hemoglobin A1c (HbA1c) levels in many other studies [8-10]. However, different researchers have shown that decreased height growth is determined by the duration of the disease rather than the degree of metabolic control [11-13]. Moreover, although T1DM is a wasting disease where the body does not generate enough energy for proper growth, it remains unclear whether weight gain is affected in children with T1DM. In one study, it was found that female adolescents diagnosed with T1DM and poor metabolic control were overweight while diabetic boys were not different than the normal controls [14,15]. Moreover, most diabetic children were found to be thin at diagnosis, but significantly gained weight during puberty, in another study. This effect was more markedly observed in girls compared to men. The researchers of this previous study also found a relationship between weight gain and the daily dose of insulin and HbA1c concentration; however, weight gain was not related to the weight at diagnosis and duration of diabetes . However, the correlation between the degree of metabolic control and weight gain seems to vary among different researchers. In one study, it was concluded that the average weight SDS was significantly increased in patients with good metabolic control compared to that of patients with poor metabolic control . However, no correlation between mean HbA1c levels and height or weight velocity percentiles or mean height or weight percentiles was observed in another study . Given the large variation among different studies, the association between diabetes duration or metabolic control and child growth has received significant medical research attention worldwide. The objective of this study was to evaluate the relationship between both metabolic control (as assessed by HbA1c levels) and the duration of disease and growth status in children with T1DM. Diabetes Mellitus (DM) is a metabolic disease that affects the metabolism of carbohydrate, protein, and fat through hyperglycemia. Hyperglycemia can be due to abnormal insulin synthesis (T1DM) or action (Type 2 DM). DM is diagnosed when a patient has a fasting blood glucose level of ≥ 126 mg/dL (7.0 mmol/L), a 2-hours blood glucose in 75-g oral glucose tolerance test (75g-OGTT) of ≥ 200 mg/dL (11.1 mmol/L), or an HbA1c of ≥ 6.5% as suggested by the American Diabetes Association [17,18]. Short stature is defined as a height of 2 standard deviations or more below the mean for age and gender (i.e., below the 2.3 percentile). Short stature can be due to a normal variant of growth, such as familial short stature and constitutional delay of growth, or pathological causes . The World Health Organization defines an underweight child as a child weighing 2 standard deviations or more below the mean for age and gender . Children with T1DM who were referred to pediatric endocrinology clinics at the King Abdulaziz University Hospital (KAUH) between June and August 2017 were included in this study. Participants were selected using the random sampling technique. A total of 189 children between the ages of 3 and 18 yrs were included. Children aged<3 and>18 yrs or had a short duration of disease (<6 months), familial short stature, hypothyroidism, celiac disease, and other chronic diseases and medical syndromes that affect growth were excluded. Informed consent was obtained from the participants’ parents prior to study participation. This study was approved by the ethical committee of KAUH. Participants were assessed during their visits to the clinics. At the initial assessment, the participants’ parents completed a demographic questionnaire with questions regarding the child’s gender, date of birth, nationality, duration of the disease, parental heights, family history of short stature, and the presence of any chronic diseases or medical syndrome. The mean HbA1c readings during the last 6 months were obtained using KAUH electronic Phoenix system. An HbA1c value of<7.5%, 7.5–9.0%, and>9.0% were considered as good, intermediate, and poor metabolic control, respectively, based on the International Society for Pediatric and Adolescent Diabetes website . Body weight and height were measured with standard scales in the clinic after the participants removed their jackets, shoes, belts, and other items. The Body Mass Index (BMI), height, weight, and BMI SDS were calculated using the Children's Hospital Boston Growth Calculator 2.01 . The data were statistically analyzed using IBM SPSS V23.0 computer software (Chicago, IL, USA). All analyses were performed after ascertaining that the data were normally distributed using the one-sample Kolmogorov- Smirnov test. The group means and standard deviations were determined using descriptive statistics. Student's t-test was used to compare the means between 2 groups, and one-way analysis of variance was used to compare the means among>2 groups. The univariate correlation analysis was performed in all patients using Pearson’s test to identify the degree of correlation of the numerical variables. A p-value of<0.05 was chosen to represent statistical significance. We initially collected data for 189 pediatric patients with T1DM who attended the KAUH for regular followup. After applying the exclusion criteria, 71 patients (37.6%) were excluded, and 118 patients (56.8% boys and 43% girls) were studied (Table 1). Of these, 63% were of Saudi nationality, 15.5% were of Yemeni nationality, and the remaining patients were from other nationalities. The mean age of the participants was 11.2 ± 4.2 yrs (range, 3-18 yrs) and the mean age of T1DM diagnosis was 6.7 ± 3.7 yrs. The duration of diabetes was<5 yrs, 5-10 yrs, and>10 yrs in 58.5%, 32.2%, and 9.3% of patients, respectively. The mean HbA1c level in patients was 9.15% (range, 5.7–18.9%). The HbA1c level was not statistically different between boys and girls (9 ± 1.9% and 9.2 ± 2.2%, respectively; p=0.7). The average HbA1c level in children aged<5 yrs, 5-10 yrs, and>10 yrs was 7.69%, 8.75%, and 9.56%, respectively (p=0.004). Approximately, 43.2% of participants had poor metabolic control (mean, 10.7 ± 1.7%), 32.2% had intermediate metabolic control (mean, 8.2 ± 0.5%), and only 17.8% had good metabolic control (mean, 6.7 ± 0.6%). The HbA1c level was not documented for 8 patients (Table 2). The HbA1c level was not statistically different among patients with a diabetes duration of<5 yrs, 5-10 yrs, and>10 yrs (9 ± 2.2%, 8.9 ± 1.5%, and 10.6 ± 1.9%, respectively (p=0.7). Fourteen patients (11.9%) were observed to have short stature, defined as a height of>2 standard deviations below the mean for age, and wasting, defined as a weight of>2 standard deviations below the mean for age was found in 13 patients (6.9%). The height, weight, and BMI measurements, which were normalized for age and gender by converting them to z-scores (the number of SD above or below the mean for age and gender), were not different between boys and girls (p=0.7, 0.11, and 0.62 for height, weight, and BMI z-scores, respectively) and among the diabetes duration groups (p=0.95, 0.79, and 0.97 for height, weight, and BMI z-scores, respectively). However, patients in the intermediate metabolic control group had lower height z-scores than patients in the good metabolic control group (p=0.049). Furthermore, patients in the poor metabolic control group had lower weight z-scores than those in the good metabolic control group (p=0.008). There was no significant difference in the BMI score among the metabolic control groups (p=0.11). No correlation was observed between the duration of diabetes and height, weight, and BMI z-scores (p=0.88, 0.74, and 0.92, respectively). The height z-score was significantly correlated with the HbA1c level in the intermediate and good metabolic control groups. Patients in the intermediate metabolic control group had lower height z-scores than those in the good metabolic control group (p=0.049). However, the correlation between height z-scores and HbA1c levels was not significant in the poor metabolic control group (p=0.117). 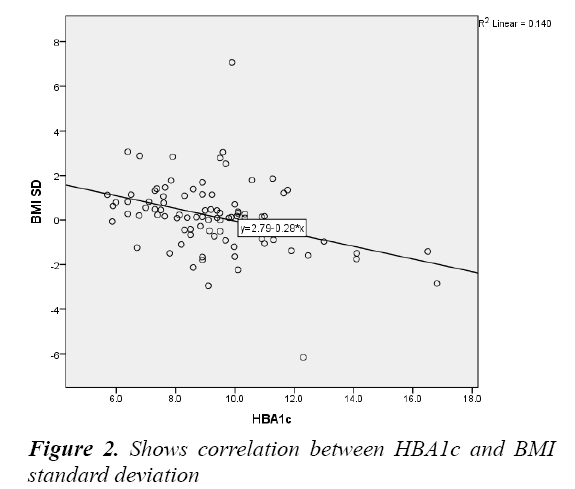 There was also a negative relationship between HbA1c levels and the weight and BMI z-scores (Pearson correlation coefficient, -0.35 and -0.38, respectively; p<0.001 in both cases (Table 3) (Figures 1 & 2). T1DM is a wasting disease where the body does not generate enough energy for proper growth, which is characterized by a severe deficiency or absence of insulin. Insulin is an anabolic hormone that has a major role in protecting against muscle and fat catabolism by ensuring glucose intake into cells. In the absence of this hormone, blood glucose levels will increase and glucose will eventually be excreted in urine. Consequently, glycosuria and unintentional weight loss will occur among un- or poorly controlled diabetics . Likewise, adequate insulin secretion is needed to maintain normal linear growth. Longitudinal bone growth is a complex process, which includes many regulatory mechanisms influenced by Growth Hormone (GH). Insulin-Like Growth Factor-I (IGF-I) binds to different Insulin-Like Growth Factor Binding Proteins (IGFBPs). Among them, the major circulating form is IGFBP-3 and its level has been shown to be GH dependent. Although IGFs have several metabolic effects, the major role of these proteins is to enhance the lengthening of long bones. One of the most important regulators of this system is insulin. Many researchers have shown that adequate insulin secretion is needed to maintain normal serum concentrations of IGFs and IGFBPs and indirectly promote growth. Therefore, low portal insulin concentrations in children with T1DM will lead to GH hypersecretion, low circulating levels of IGF-I and IGFBP-3, and high circulating levels of IGFBP-1. In turn, these changes due to portal insulin deficiency result in an increased risk of growth impairment . T1DM is one of the most common chronic endocrine disorders among children and adolescents, and its complications, including impaired childhood growth, remain a major concern. In this study, we aimed to address the relationship between metabolic control and the growth status in children with T1DM. The mean age of participants was 11.2 ± 4.2 yrs, and the mean age of T1DM diagnosis was 6.7 ± 3.7 yrs. About 58.5% of patients had duration of diabetes for less than 5 yrs, 32.2% for between 5 and 10 yrs, while only 9.3% had duration of diabetes with more than 10 yrs. 43.2% of them had poor metabolic control with HbA1c level more than 9 (mean is 10.7 ± 1.7), 32.2 % had intermediate metabolic control with HbA1c level between 7.5 and 9 (mean is 8.2 ± 0.5), while only 17.8% had good metabolic control less than 7.5 (mean is 6.7 ± 0.6). The level of HbA1c was not documented for 8 patients. The mean HbA1c level in patients was 9.15, ranging from 5.7 to 18.9. There was no statistically difference in the level of HbA1c between males and females (9 ± 1.9 and 9.2 ± 2.2). Average HbA1c level at ages younger than 5 yrs was 7.69, for ages 5 to 10 yrs was 8.75, and in ages 10 yrs and older was 9.56. Difference in mean HbA1c levels based on age was statistically significant. There is no statistically difference in the level of HbA1c between patients with duration of diabetes less than 5 yrs, between 5 and 10 yrs and more than 10 yrs (9 ± 2.2, 8.9 ± 1.5, and 10.6 ± 1.9, respectively). Height, weight and BMI measurements were normalized for age and gender by converting them to z-scores (the number of SD above or below the mean for age and gender), those measurements are compared between males and females but there were no statistically significant differences. They were also compared among groups with different duration of diabetes and there was no significant difference. Comparing the same scores between groups based on the metabolic control status showed significant difference in height score (p-value=0.049) with patients in the intermediate control group have lower height z-score than the patients in the good metabolic control group. There is also significant difference in weight score (p value=0.008) with patients in the poor metabolic control group have lower weight z-score than the patients in the good metabolic control group. There was no significant difference in the BMI score (p-value=0.11). We observed no correlation between the height, weight, and BMI z-scores and the duration of diabetes in this study. Similar findings were observed by Khadilkar et al. who evaluated the impact of diabetes duration on growth by comparing the height-for-age (HAZ) z-scores across tertiles based on the duration of diabetes in children (2.3 ± 2.8 yrs). They observed no significant differences in the HAZ scores across tertiles. In contrast, Bonfig et al. observed that adult height was negatively correlated with the duration of diabetes (p=0.0015) in a multivariate regression model of 22651 children with T1DM from specialized centers in Germany and Austria. Correlation between the height, Weight and BMI z-scores and HbA1c level showed significant difference in case of the height score (p-value=0.049) with patients in the intermediate control group have lower height z-score than the patients in the good metabolic control group but this correlation is not significant in case of poor metabolic control (p-value=0.117). On the other hand, there was negative significant relationship between HbA1c level and the weight z-score and BMI z-score, the Pearson correlation coefficient is -0.35 and -0.38 respectively and the p-value is less than 0.001 in both cases. Similar to our findings regarding height and weight, Salerno et al. concluded that blunted total pubertal growth was observed both in boys (24.5 ± 3.6 cm) and girls (20.1 ± 4.2 cm). The decrease in height gain was independent of the duration of IDDM or the degree of metabolic control . Furthermore, Assar et al. observed a significant increase in the average weight SDS in patients with good metabolic control compared to those with poor metabolic control. No significant difference in the height SDS was observed between the good and intermediate metabolic control groups, which indicate that normal relative growth can be expected in diabetic children with an intermediate metabolic control . In another study, Clarson et al. studied the growth and pubertal development in 122 children, and found no correlation between mean HbA1c levels and height or weight velocity percentiles or mean height or weight percentiles. Therefore, diabetic control, as reflected by HbA1c levels, was not a major determinant of growth in this group of children with IDDM . Similarly, Kanumakala et al. found that there was no significant correlation between metabolic control and linear growth in boysor girls. However, Elamin et al. found that the retardation in physical growth and pubertal development was positively correlated with the duration of diabetes before the onset of puberty and HbA1c concentration. Weight gain was found to be independent of weight at diagnosis and the duration of diabetes, but positively correlated with the daily dose of insulin and HbA1c concentration . There was no association between the duration of diabetes and height, weight, or BMI z-scores. 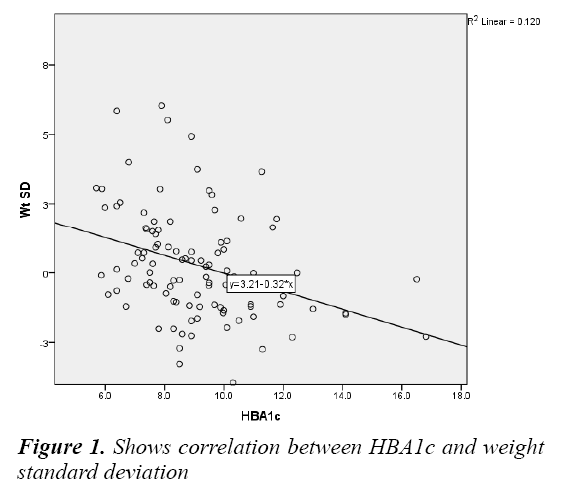 The HbA1c level was correlated with the height z-score, the intermediate metabolic control group had lower height z-scores than patients in the good metabolic control group, but this correlation was not significant in the poor metabolic control group. The HbA1c level was negatively correlated with both weight and BMI z-scores. The association between the duration of diabetes or metabolic control and child growth varies among different studies; therefore, conducting systematic reviews of these different studies may be an important step to reaching a better understanding about growth status in children with T1DM. The authors express their sincere gratitude to the student’s research support committee in the faculty of medicine, King Abdul-Aziz University for helping in obtaining the ethical approval. The authors thank all of the study participants. Silverstein J, Klingensmith G, Copeland K, et al. Care of children and adolescents with type 1 diabetes: A statement of the American Diabetes Association. Diabetes Care 2005; 28: 186-212. Al-Rubeaan K. National surveillance for type 1, type 2 diabetes and prediabetes among children and adolescents: A population-based study (SAUDI-DM). J Epidemiol Community Health 2015; 69: 1045-1051. Kim MS, Quintos JB. Mauriac syndrome: Growth failure and type 1 diabetes mellitus. Pediatr Endocrinol Rev 2008; 5: 989-993. Virmani A. Growth disorders in type 1 diabetes: An Indian experience. Indian J Endocr Metab 2015; 19: 64-67. Marcovecchio ML, Heywood JJ, Dalton RN, et al. The contribution of glycemic control to impaired growth during puberty in young people with type 1 diabetes and microalbuminuria. Pediatr Diabetes 2014; 15: 303-308. Elamin A, Hussein O, Tuvemo T. Growth, puberty, and final height in children with type 1 diabetes. J Diabetes Complications 2006; 20: 252-256. Kanumakala S, Dabadghao P, Carlin JB, et al. Linear growth and height outcomes in children with early onset type 1 diabetes mellitus. A 10 year longitudinal study. Pediatr Diabetes 2002; 3: 89-193. Lebl J, Schober E, Zidek T, et al. Growth data in large series of 587 children and adolescents with type 1 diabetes mellitus. Endocr Regul 2003; 37: 153-162. Salerno M, Argenziano A, Di Maio S, et al. Pubertal growth, sexual maturation, and final height in children with IDDM. Effects of age at onset and metabolic control. Diabetes Care 1997; 20: 721-724. Grgic A, Rosenbloom AL, Weber FT, et al. Joint contracture-common manifestation of childhood diabetes mellitus. J Pediatr 1976; 88: 584-588. Stipančić G, La Grasta Sabolić L, Jurcic Z. Growth disorders in children with type 1 diabetes mellitus. Coll. Antropol 2006; 30: 297-304. Khadilkar VV, Parthasarathy LS, Mallade BB, et al. Growth status of children and adolescents with type 1 diabetes mellitus. Indian J Endocrinol Metab 2013; 17: 1057-1060. Domargård A, Särnblad S, Kroon M, et al. Increased prevalence of overweight in adolescent girls with type 1 diabetes mellitus. Acta Paediatr 1999; 88: 1223-1228. Assar KR, Bashirnezhad S, Yazdanpanah L, et al. The relationship between metabolic control and growth in children with type 1 diabetes mellitus in southwest of Iran. Scientifica 2015; 1-5. Clarson C, Daneman D, Ehrlich R. The relationship of metabolic control to growth and pubertal development in children with insulin-dependent diabetes. Diabetes Res 1985; 2; 237-241. American Diabetes Association. Diagnosis and Classification of Diabetes Mellitus. Diabetes Care 2010; 35: 64-71. World Health Organization. Nutrition landscape information system (NLIS). Country Profile Indicators: Interpretation Guide 2010. ISPAD. International society for pediatric and adolescent diabetes. ISPAD 2017. Conway B, Miller RG, Costacou T, et al. Adiposity and mortality in type 1 diabetes. Int J Obes (Lond) 2009; 33: 796-805. Giannini C, Mohn A, Chiarelli F. Growth abnormalities in children with type 1 diabetes, juvenile chronic arthritis, and asthma. Int J Endocrinol 2014; 1-10. Bonfig W, Kapellen T, Dost A, et al. Growth in children and adolescents with type 1 diabetes. J Pediatr 2012; 160: 900-903.